1. Squirt gun fun: Set up an easel, pack a water gun full of liquid watercolors, and you have an afternoon filled with an art project that requires little to no patience, but turns out beautifully every time. Thanks to Fireflies and Mudpies for the fAuntastic idea! 2. Playing with a pipette is a great way to help them work on their fine-motor skills. Set up a few bottle caps on a tray and let your niece or nephew have fun trying to shoot them from a distance or to delicately pour them into a few of the smaller ones. Check out Fantastic Fun and Learning for more details. 3. Water balloon tosses: Load up the water balloons for games that can last all day – without the danger of someone getting hurt! Use some of the chalk from Week 2 of Aunt Camp and draw a target on the sidewalk. They can throw the water balloons for a bull’s-eye instead of at their brother or sister! 4. Wet Head: Try the new Wet Head game from Zing Toys. Our friends at TTPM.com that Wet Head is the "hilarious new family/party game that can leave you all wet. The game comes with a yellow helmet and a spinning unit that snaps on the top. Snap the unit onto the helmet and insert pins in each of the holes. Then, fill the chamber with water, and you're ready to go. On each turn, place the helmet on a player's head. Spin the spinner to see whether to pull 1 or 2 pins, pass, reverse or other variations. If you pull a pin and nothing happens, you got lucky. The turn passes. Play continues till one player pulls the pin that releases the water and gets a wet head! Play continues as long as you want, or until everyone is completely water-logged." We've seen this new toy in action, and boy, is it fun! 5. Make the biggest bubbles EVER: First, make the wands out of two wooden dowels and two pieces of yarn or string. Then, fill a kiddy pool with water, dish detergent, corn syrup and glycerin. Dip the strings into the chemistry combo, and you’ve got beautiful fun in the sun! 6. Time for the coolest science lesson ever: Teach the kids about evaporation! Tell them to hold a cotton ball over a cup of water outside. The cotton ball will fill up with the evaporated water. Make it rain by squeezing the cotton ball. 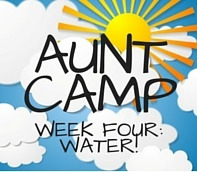 Home Activities AUNT CAMP 4: Water!